It’s no secret that grocery stores make money by marking up the items they sell—but the amount of mark-up varies a ton from product to product. “Items that are highly perishable, and so might get thrown away before they’re bought, tend to get a higher mark-up,” says Andrea Woroch, a consumer savings expert. Coupons are one way to combat high prices, if you're careful (check out the free app Coupon Sherpa for an easy way to digitally clip and organize coupons). But for some items, a coupon probably won’t cut it. Woroch recommends shoppers skip these items entirely at the grocery store. 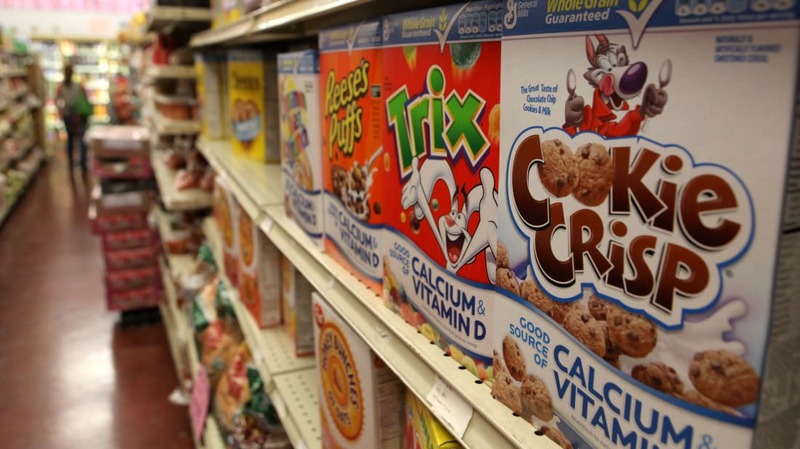 “The price of cereal has been rising for years,” says Woroch, and if you stick to your name-brand cereal you’ll feel the pinch in your wallet even more. That’s because all of the advertising and marketing costs that go into convincing consumers that one brand tastes better than another get passed along to shoppers. If you compare the ingredient list of generic and name-brand versions of the same cereal, you’ll probably find the same ingredients—in the exact same order. Make the switch to the cheaper box, and you can save 50 percent or more, according to Woroch. “And most stores offer a money-back guarantee on their own brands, so if you do taste a difference you can get a refund,” she says. You probably already know that all of those packages of cubed squash, diced mushrooms, and sliced watermelon cost more than buying the whole produce. But did you know that the mark-up is typically 40 percent or more? "For a task that takes less than five minutes, you’re paying a big difference,” says Woroch. Like prepackaged produce, the convenience of buying pre-formed hamburger patties or assembled steak kebabs is going to cost you—anywhere from 60 to 300 percent(!) more than buying the meat in its whole form. But there’s a (cheaper) middle ground between buying a giant hunk of meat and the pricey prepped version: Ask your butcher to grind or cube a cut for you, to make your work at home faster. These are a classic impulse buy, which is why they often line the check-out lanes at supermarkets, where you’re less likely to take the time and comparison shop. But you can save 50 percent or more by buying them at a big-box store, like Target or Walmart, or stocking up at a warehouse store, like Costco. Batteries don’t have a shelf life, so buying in bulk shouldn’t give you pause. Single-serve portions of chips and pretzels typically run 30 percent more per ounce than a big bag of the same product, according to Woroch. If you like the grab-and-go convenience of the smaller sizes, she suggests buying the bigger bag and then doling it into small bags as soon as you’re home, so your pantry is stocked with DIY snack-size containers. Drugstores typically offer better deals—and more frequent sales—than grocery stores, when it comes to personal care products, says Woroch. That means tossing deodorant or shampoo into your grocery cart could cost you an unnecessary 30 percent more.